The world view that we carry as a culture—our sense of optimism and of responsibility to future generations, our relationship to our neighbors and neighborhood, our capacity for empathy, our ability to recognize and mourn collective cultural losses—shapes our economic decisions. Much of the work that we do in the Schumacher Center is meant to highlight this connection: micro-credit programs, local currencies, community support of farmers and small businesses, and community land trusts are all economic vehicles in which the relationships between consumer and producer, producer and environmental resources, employer and employee, lender and borrower, and their cumulative effect on future generations are all highly visible. Waleed El-Ansary is a doctoral candidate in economics at George Washington University and a research analyst at the School of Islamic and Social Sciences in Washington, D.C. Like Schumacher, this young economist believes that all his work must flow from the answer to these two questions. After reading Small is Beautiful: Economics as if People Mattered, Waleed wanted to know the philosophical sources that led Fritz Schumacher to his economic conclusions. Through Barbara Wood’s biography of her father, Waleed learned that Schumacher’s personal library and unpublished papers were intact, and through Internet searches he discovered that they were housed and catalogued at the Schumacher Center in the Berkshires. With fellow researcher Joseph Lumbard of Yale Divinity School, Waleed traveled to Great Barrington and spent days pouring over Schumacher’s books and papers, reading margin notes, examining multiple drafts of talks, and tracing the development of Schumacher’s economic theory from its roots in a rich literature of moral thought and action. They found the metaphysical works of Rene Guenon, Ananda Coomaraswamy, Frithjof Schuon, and Titus Burckhardt as well as books by Gandhi, Goethe, Martin Buber, Simone Weil, and Rudolf Steiner (to name only a few)—all with underlining and margin notes. 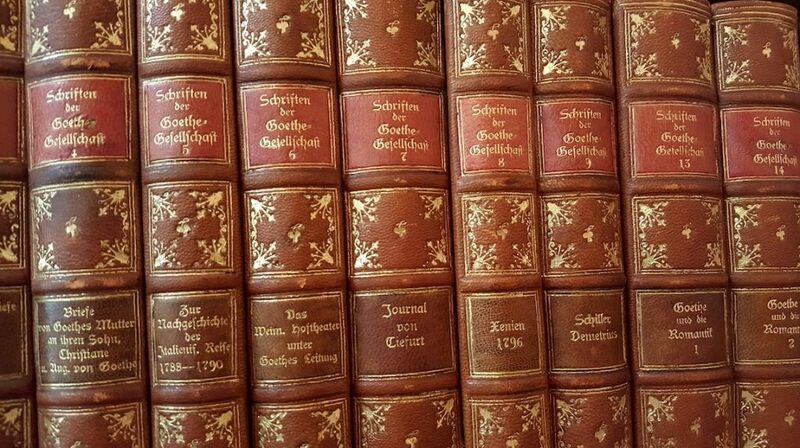 In fact, the majority of the material in Schumacher’s personal library deals with ethical rather than economic issues. Yet this was the collection that shaped one of the most quietly influential treatises on economics written in the second half of this century—a book guided by a belief in our responsibility to other human beings and to the earth itself. Waleed and Joseph plan to continue their study of the works that influenced Schumacher and through it to raise, in the academic world, the question of the impact of values on our economic system. This is just one of a growing number of stories of visiting researchers inspired by the library at the Schumacher Center. The Solidago Foundation just awarded the Schumacher Center a grant to place the computer-indexed book and pamphlet catalogues of the library on the Internet so that researchers unable to travel to Great Barrington will now have access to the collection. Our resource coordinator, Erika Levasseur, is working hard to have everything ready for the library’s online debut in February. New donations of equipment and books have been received, including the agricultural library of our late neighbor, Robyn Van En, co-founder of the Community Supported Agriculture movement in North America. These titles will be kept together in a CSA collection at the Schumacher Center. As with Fritz Schumacher’s library the titles can be sorted and viewed separately over the Internet so that researchers can see what books influenced the birth of a movement. Additional archival collections already in hand include those of George Benello, Ralph Borsodi, and Robert Swann, and we are making room for additional decentralist collections. The board of directors has set a goal of raising $100,000 during the next year to retire the $95,000 mortgage on the Schumacher Center building and make some necessary improvements in the lower level, the much-needed future archival storage area of the library. The fundraising goal is part of a year long celebration of Bob Swann’s 80th birthday. Bob designed the library and has overseen all the construction work, much of it by volunteers. It would delight him to have the mortgage retired.